Description of organization Alytus Art School is 4 year art school for teanagers who attent the school additionally as complementary to the secondary school. there was a network of such schools in the Soviet times, but at the moment of capitalist development it was left for the individual rotting down. 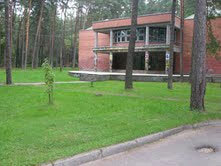 Alytus Art School was the only school in Lithuania to proceed into the way of experiments and performance. since 1993 the were organized outdoor events based on performance and sometimes on political direct action - joint political and artistic approach was developed through from the very beginning. at 2005 the tradition obtained the title of Alytus Biennial. The project Alytus Biennial is a logic continuation of numerous international experimental art festivals and events held in southern Lithuanian town Alytus since 1993. So far the essential element for the town is an absence of any artistic infrastructure (no galleries, art museums, nor even some exhibition hall in the city hosting 70 000 inhabitants – sic! - and even no any promises from the municipal authorities) the events were held directly in the streets and other urbanist common places. The essential element for any of those activities was political-artistic behavior and problematic. 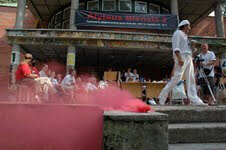 As a clearly defined event under the name of Alytus Biennial the event appeared in 2005. 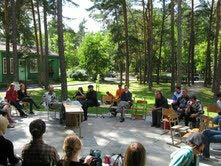 The basic idea for it was to continue experimental art tradition directly in the urban spaces of the town. So far it took the title “Beware!Politics!” it really stood somewhere in-between of arts and politics. The biennial also clamed for debienalization of arts and society so to respond to increasing number of various biennials appeared as art-value in itself. The communal approach of the artists community was taken as a highest value of the event to continue the development further. The biennial of 2007 was given to youth with a task simply to demystify it’s importance an so to trap the sacred name of it. So far they did not succeed to destroy the biennial as the symbol of “serious culture” – next step was Art Strike Biennial. : to cease any artistic activity related to mimicking of Vilnius European Cultural Capital and/or any establishment in Lithuania in 2009. Establishment got pierced and Biennial turned into an activity to not produce arts every second the year. Late August 2011 we'll continue on a tradition to not to do arts and will held the world congress of DAMTP (Data Miners & Travalleurs Psychique). it's planned to lead towards the general strike in 2012 accomplishing it with creative experience and psychic liberation of humanity. Also supports whatsoever attempt to destroy any biennial event, any cultural capital celebration and also we aim to support general art strike as well.